OXFORD – Oxford Area High School junior Hayley Allport is a talented musician and is assigned first chair of the flute section in the concert band. But, it is Hayley’s second love, color guard with the marching band, which earned her a place in the 2015 Macy’s Thanksgiving Day Parade. 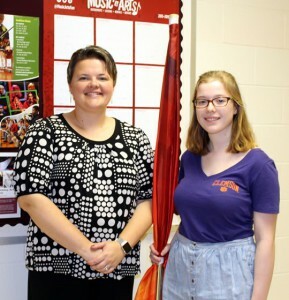 Hayley Allport,with OAHS band director Erin Kauppila, will perform in the color guard flag team of the Macy’s Great American Marching Band during the annual Macy’s Thanksgiving Day Parade, November 26, in New York City. Hayley, daughter of Julie and Eugene Allport, was recently selected to perform in this year’s parade in New York City as a member of the color guard flag team of the Macy’s Great American Marching Band. The band is comprised of students from every state in the nation, all of whom had to complete an application and audition process in order to be selected. Hayley will travel to New York on November 21 to participate in rehearsals and leadership activities, as well as sight-seeing of New York attractions and attendance at two Broadway musicals. On Thanksgiving Day, the band will march in the 89th annual Macy’s Thanksgiving Day Parade and will perform in Herald Square for over 2.5 million spectators and a global television audience. The parade will be broadcast live on NBC-10 from 9 a.m. to 12 p.m.
Hayley began playing flute at age five and has been a member of her school bands since Nottingham Elementary School, earning numerous area honors band selections. When she was about to enter ninth grade she decided that in addition to performing with the concert band she would like to join the Marching Hornets as a member of the color guard. During the summer before her freshman year, Hayley attended color guard camp at West Chester University in order to learn flag twirling and eventually saber twirling. She has returned to the WCU camp each summer since then. Hayley, who has also participated in the jazz band and the spring musicals, and sings in the OAHS Chorus, Choral Ensemble and Bella Voce, is part of a musical family. Her mother, Julie, is the band director at Sacred Heart School and was a music teacher and elementary school band director in the Oxford Area School District for many years. “My mom wanted me to play anything but the flute. She felt flute was too competitive because everyone plays it,” said Hayley, who has taken lessons at the Music School of Delaware since she began playing. 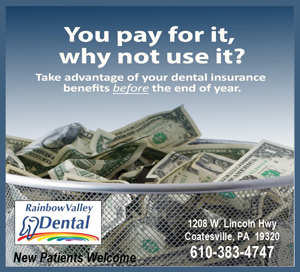 Hayley’s brother, Seth, played trombone in the high school bands and performed at many Pennsylvania Music Educators Association festivals and conferences. He is currently studying computer science at Indiana University of Pennsylvania, where he is a member of the marching band. In addition to her musical pursuits, Hayley is a member of the high school’s team in the Chester County Academic Competition, Future Business Leaders of America, the Helping Hands community service club and the LEO Club sponsored by the Oxford Lions. After graduation she would like to study engineering while continuing to perform in college musical groups. While Hayley and the members of the Great American Marching Band will perform before millions both on the parade route and on television, she thinks the best part of Thanksgiving Week will be having the opportunity to collaborate with others on an entirely new musical endeavor. “We’ll have a lot of practices, since they don’t teach any of the work for the guard or the dancers beforehand because they don’t want us to learn it the wrong way,” she said. “I’m really looking forward to meeting band members from all over the country and getting together with a group of people who love music and color guard.